I like the visual representation of data in this chart, reproduced from Nicolas Rapp’s quite interesting Information Design blog. 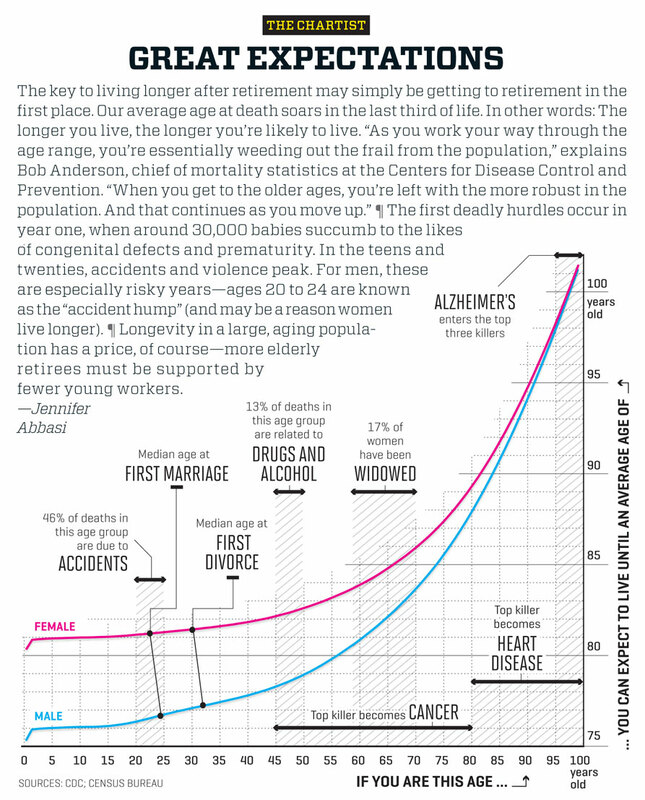 I find the data both counterintuitive and yet very intuitive at the same time: The longer you have lived thus far, the longer you are likely to live overall, even though younger people will benefit more from life-extending innovations. According to these data, my expected lifespan is 77 years, which gives me about 50 more years to try to make the best of what I have. Maybe that doesn’t sound like a lot, but I am definitely fine with it. As surprising as it sounds, a life expectation of 77 years is actually 46 years longer than the average life expectancy we’ve had only 100 years ago. Also interesting are the facts (or my inferences?) that people are most likely to die from accidents, on relative terms, when they are also most likely to get married; and that mid-life crisis seems a lot more lethal than teenage angst and depression, which we associate more with drug use. However, I maintain some serious reservations about the validity of this graph on cross-temporal basis. It might reflect an accurate snapshot of statistics as they are now, but major scientific discoveries do not follow a linear path, and it is virtually impossible to model them accurately in our predictions. Just as antibiotics and vaccines suddenly gave us much longer lifespans, I foresee a similar jump in the near future as a result of the proliferation of biologic drugs and nanotechnology, which will eventually replace the traditional pharmaceuticals. On a related postscript, I highly recommend this short clip by Prof. Hans Rosling (and his other work), if you are interested to learn more about life expectancy and its relation to economic development. ← Racism in Fantasy: Are Young Adults Above It? This is a wonderful article. I will spend more time researching this topic.